As the American population gets grayer, researchers are doing more studying of those who have defied the odds -- people who are 80 and older and still are cognitively sharp. What they hope to glean by scrutinizing this elite group of SuperAgers is to identify ways to stave off memory loss. Emily Rogalski, a neuroscientist at the Alzheimer's Disease Center at Northwestern University Feinberg School of Medicine, researches aging and dementia and is the lead author of a recent study that illuminates these differences. For example, special MRI scans have revealed that a SuperAger has a cortex -- or outer layer -- that is thicker than the typical 80- to 90-year-old. Also, deep within the brain, a small region important for attention is bigger than even in the brains of middle-aged participants. Q: Can the brain improve with use? A: It wasn't so long ago that we thought you were born with all your brain cells, which will eventually die. Now we know that it's possible for brains to change and to make new connections and neurons, which has changed the way we think about brain development and aging. Q: So what have we learned from these cognitive SuperAgers? A: We now have research suggesting that keeping your body and brain active is certainly helpful to the brain cells. If good nutrition, moving and stretching are good for our body, the same is true for the brain. Q: So do you mean doing something like crossword puzzles will keep us sharp? A: There's nothing magical about crossword puzzles. ... If it were true, it would be much more cost-effective than spending millions of dollars on Alzheimer's. The key to keeping your mind active is finding something that challenges you and you love to do. So if you hate crossword puzzles, the angst outweighs the benefits. But there's no question that mental agility is a good thing. ... So instead of waking up and following the same regimen, do something different. If you start your day with the news, then do yoga or take a walk. Q: Does a positive attitude have any effect on the brain? A: There is some preliminary research that SuperAgers tend to be more extroverted, more open and have a good attitude, but these are only preliminary findings. In our center, we are trying the same thing for those with dementia. What can I still do? What can I do to feel empowered? How do I stay engaged in life?. We have a buddy program, where first-year medical students meet (with patients) for coffee ... because that personal contact is important. We don't have a cure (for dementia) yet, and medications are limited. So we're constantly asking: How do we help in the here and now? What are solutions to improve quality of life? Because a dementia diagnosis doesn't mean that life stops. Q: Can brain decline be reversed? A: It's possible to change connections. 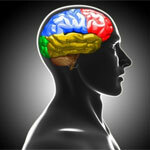 People (with brain injury) can recruit other parts of the brain to take over. For example, language is housed in the left hemisphere, but people who have had a stroke may recruit some of the right hemisphere to help out. We know the brain is remarkably plastic. ... and can be changed and modified. ... But right now we can't regenerate those cells that are lost ... and we have a long road ahead of us. Q: Are more people getting Alzheimer's ... or are we just getting better at diagnosing? A: We have an uphill battle for a few reasons. We've gotten really good at helping people live longer, with more cures for heart disease and stroke. So our life span is increasing and the biggest risk factor for Alzheimer's is age. Q: So what does that mean for us, as a society? A: That our life span is outpacing our health span ... and that is one of our biggest challenges: How to balance our life span -- or how long we're living -- with our health span, which is how well we're living. We also have to recognize that caregivers are vulnerable. ... You can start out with one and end up with two people having cognitive distress. Q: Northwestern created a test that doctors can use to evaluate patients' cognition that requires participants to identify famous faces. But many of the noteworthy folks were unrecognizable to Americans in their 40s to 60s -- such as James Cagney, Martha Mitchell and Emperor Hirohito. A: Yes ... they were outdated. We replaced some of those faces with Oprah, Muhammad Ali and Bill Clinton. But there are some people -- like Albert Einstein -- who stand the test of time.